Are Car Seats Necessary for Babies in India? Babies, being their restless selves, make travelling with them a challenge. Thus, baby car seats have become the need of the hour. Just click them in your car and make your car ride a hassle-free experience! This innovative baby care accessory comes with comfy cushioning, safety buckles and headrests for the little ones. They make the baby comfortable in the car. These range of child care products are of two types. First, infant carriers exclusively for babies. Second, convertibles that can be used throughout the childhood of the baby. Installing one of these would make the car a joy ride for moms as well. Having the baby bundled up and cozy in the car seat prior to leaving the house makes life much easier. Carrying the little one from one destination to another without disturbing their sleep gives mothers a chance to travel. This is the why we have picked the three best car seats for you and have a guide on how to use them. This car seat can be used for kids between the ages of 0 to 5 years. It comes in another variant for children between the ages of two to five years. The infant will be able to recline in three positions for optimum comfort. The padded wings give the baby protection from side impact. It comes with a European standard 5-point safety harness. Jack n Jill is available in three color combinations, namely, black-grey, yellow-blue and crème-grey. This sleek convertible seat fashioned to look like a sports car seat, comes with a washable cover. Additionally, it features a one-pull adjustment which makes adjusting the safety belts on the baby swift and effortless. It comes in two variants depending on the age of the child. The first one is for babies up to 15 months old. The second is for infants up to three years of age. The sports car seat comes with a washable cover and 5-point safety harness. It is available in colors red, blue and black. This car seat is also a convertible carry cot! Picaboo is exclusively for babies up to 15 months old. The blue and grey seat can be adjusted up to four recline able positions. It doubles as Carry Cot, Rocker and Feeding Chair as well when used in different positions. This wonderful accessory also comes with an inbuilt canopy that protects the baby from direct sunlight. It also features a 3- point safety harness. The super soft cushions are designed to ensure the comfort of your new born. Picaboo’s cover is removable and washable so you can clean it regularly. Now that we have looked at the best of car seats, here are a few tips on purchasing one. •	Child safety seats are designed using safety standards and comfort of the child. They make travel convenient and stress-free. Instead of balancing the baby on the lap for hours on end just put in a seat in the car, strap your child in a comfortable position and relax. •	While buying a comfortable seat for your baby’s car travel, check the maximum weight the seat can carry. Along with this, also check the height and age requirements. •	Make sure your car is compliant with the installation of a baby car seat. •	Have a professional verify that the installation of the seat is done properly before use. •	Pick a seat with a fabric that is easy to clean. •	Ensure that the harness and recline positions offered by the product are comfortable for your baby. •	Make sure that the baby is dressed lightly as several layers of clothing will make it harder for the harness to secure firmly. It will also cause the baby discomfort. If you are concerned about the baby feeling cold just put a blanket over him or her. Additionally, here’s why a car seat is a must have. Baby car seats are a few of those baby care items which have been introduced in India recently. Thus, most parents aren’t fully aware of how crucial these are. At first look, they seem to be complicated and look like contraptions for your little one. However, their purpose is the same as yours- to provide security and consolation for you and your baby. Over 17 years of innovation has led to the development of child safety seats. These seats are designed with road safety and security standard in mind. An immense amount of precision is used in manufacturing them. They promise the safe-keeping of your precious as well as their comfort in the car. 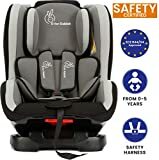 While it is not yet mandatory to have car seats when travelling with infants in our country, they have been made obligatory in most first world countries. It is quite a daunting task to travel or commute with an infant in tow. Given the constant care and attention babies require, it becomes very difficult for a parent to get work done. Especially, for mothers who have to take care of chores that make it necessary for them to step out of the home. The roads in India are infamous for being full of bumps and pot holes. Additionally, for those of us in cities, traffic and having to constantly stop at signals makes travel jerky and rough. Thus, the safety of the child becomes a prominent issue while cursing the roads. This is why car seats are necessary as prevention is always better than cure! Thanks for the review. i was looking for the car seats for my baby. This really helped me. Hi Sunita, Thanks for your comment!